A cataract is the gradual clouding of the part of your eye known as the crystalline lens. Cataracts occur when there is a buildup of protein in the lens that makes it cloudy. This buildup prevents light from passing through the lens, causing some loss of vision. It is not known what causes the buildup of the protein responsible for clouding the lens. and age over 65 years. Age-Related Cataracts, as the name suggests, develops as a result of aging and is the most common form of Cataracts. Seventy percent of individuals over 75 years of age have Age-Related Cataracts. Congenital Cataracts are sometimes found in babies as a result of an infection they had before prior to birth. 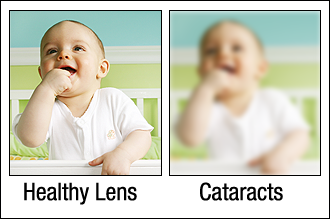 Congenital Cataracts can also develop in young children. Some Cataracts may develop as a result of other diseases, like diabetes, or long-term exposure to toxic substances, certain medications (such as corticosteroids or diuretics), ultraviolet light, and radiation.